At BEA 2017 this year, I had the amazing privilege of connecting with Smith Publicity. It's thanks to them that I was able to get my hands on Birthrights. It interested me because I’m big on stories that have to do with legacy and lineage. Done right, you get a lot of good back story that will put a spin on whatever the actual story is going to be about. I must say though that my foray outside of my YA/MG comfort zone has been quite the experience. It’s adult fantasy, and centers on quite a number of characters, with a young man named Whym right in the thick of everything. The whole thing is set amidst a world on the brink of the fulfillment of a prophecy only too few people know of, but will impact absolutely everyone when fulfilled. After finishing, I was thinking, boy, this isn’t a feel good book. It’s not exactly Game of Thrones type stuff where you kinda, sorta need to be dead to the characters so you don’t die when they do… but some really intense stuff happens in here. Is it bad? Absolutely not. Quite the opposite. It’s very well-written, character-centric and borders a bit on the darker side of fantasy. With Birthrights, I have once again found myself completely sold on the idea of wanting… nay… needing the next book in a series. I mean, let’s talk about the lore, shall we? It is a very slow burn for someone like me… but it’s worth the wait. J. Kyle McNeal weaves an intricate tapestry of characters and events for a time, until suddenly, the payoff kicks in! Don’t want to spoil, but the windup to the mythical/magical parts of this tale is pretty cool. Not to mention the fact that each chapter starts with excerpts from books and cultural adages from within the story itself, which also adds to the immersive experience. There is strong storytelling here, and a well-crafted enough backstory/world building combo that is enough to make someone who is NOT the target audience of this genre invested in what happens next. 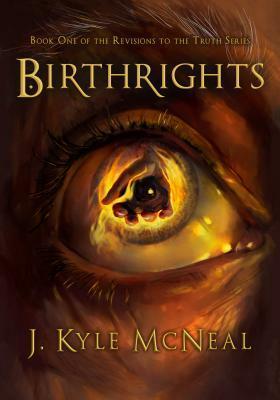 Birthrights went on sale June 6th and should be available everywhereabouts, if you want to snag a copy to read for yourself.